On September 4, NYRA hosted a groundbreaking ceremony for its highly anticipated addition: the 1863 Club! 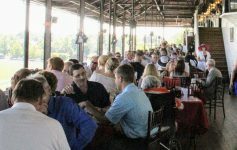 The building, which will replace the current At the Rail Pavilion, as well as the seasonal tents and trailers at the end of the Clubhouse, will feature fantastic new amenities and guest services while nodding to Saratoga’s past. The new, 36,000-square foot building will provide hospitality and amenities for guests, including a banquet area, dining club, bar, and luxury boxes, plus three floors of usable space and a full-service kitchen. But where did the Club’s name come from? 1863 saw Saratoga’s very first organized thoroughbred racing meet, which took place over only four days in August. 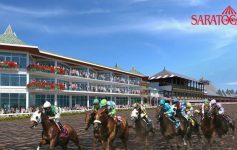 While promising to add even more modern flair to Saratoga Race Course, the new building will remind guests of the long horseracing tradition in Spa City. Architectural rendering provided by NYRA. 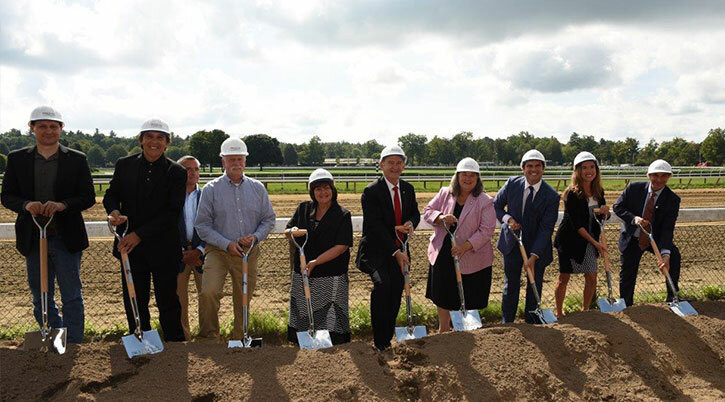 This week’s groundbreaking ceremony was attended by NYRA executives and local elected officials, as well as the construction project’s contractors and architects. Representatives from Albany’s Gilbane Building Company, Saratoga County’s MLB Construction Services, Saratoga Springs’ Frost Hurff Architects, and New York’s SOSH Architects all spoke at the celebratory launch. Do you want to be a part of 1863 Club’s inaugural season? 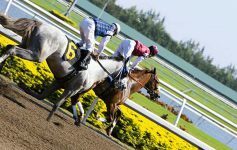 Contact the NYRA Sales Office at (518) 693-7655 or online at NYRA.com/1863Club.